All our accessories are made to order. Fabrics are available in an extensive range of colours choosing from either Solacryl or Sunbrella. And now we also have thread options, standard Hemmingway and Bartlet polyester or Gore Tenara 100% UV resistant PTFE. Lettering can be stitched on to the covers and accessories if required. Many typefaces are available. Constructed using coated Marine Acrylic, the Stackpack slides into the boom with the mainsail eliminating the need for extra fittings on the boom. If the mainsail is loose footed, the Stackpack will have a foot groove. The main body of the cover is fitted with full-length removable battens, 2, 3 or 4 reinforced lazyjack attachment points (depending upon the boom length), and a full-length zip closure. Where required there are zipped entries for the reef lines which are fitted with multiple sliders to enable correct line positioning. Internal ties are fitted to allow the Stackpack to be rolled to the boom if required. Once zipped up, a front cover is buckled on to protect the luff area of the sail. The Stackpack must be used in conjunction with Lazyjacks. The Lazyjack system is a method of controlling the mainsail whilst it is lowered. The sail drops between the Lazyjack lines and is held on the boom until it can be secured. Lazyjacks can be easily fitted to existing rigs. Their size and complexity depends upon the boat and boom length. The Lazyjack lines are attached either to eyes on the stackpack cover or directly to the boom. This protects the mainsail (or mizzen) when it is on the boom. The cover can be straight cut for boltrope luffs, or with a neck, which wraps around the mast for mainsails with slides. 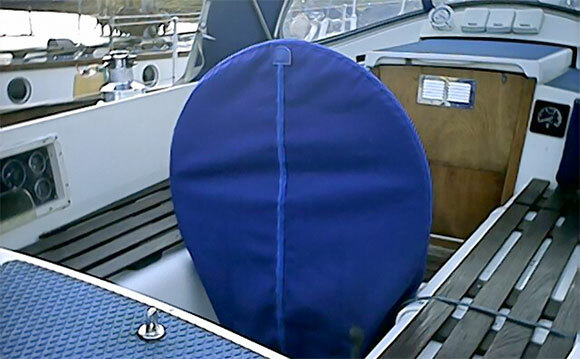 The mainsail cover is fastened and secured around the sail with snap buckles. These are usually supplied in pairs for port and starboard of the cockpit. Reinforced eyes are fitted to allow attachment with cord or cable ties. Boat names can be stitched on in your choice of style. Boat wheels can be covered by hand with leather to give a real touch of luxury. A range of colours and textures are available. Rope in a Turks Head knot pattern is fitted to show the centre position.